The Rome tapestry shows a scene of St. Peter's Basilica, The Bridge of Angels, and Castel Sant'Angelo as seen from the Tiber river. Here we see these iconic architectural buildings all in one location. The Castle of the Holy Angel on the right is a tall towering castle, and has an angel statue at the top from which its name comes from. The Papal Basilica has a glorious facade and is an Italian Renaissance church designed by Bramante, Michelangelo, Maderno and Bernini. 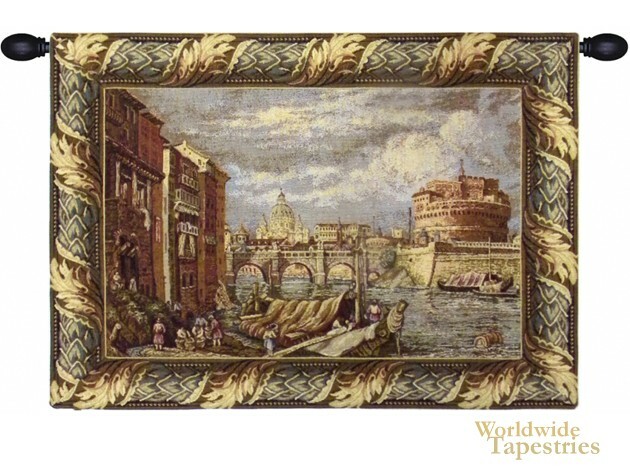 This Rome tapestry is backed with a lining and a tunnel for easy hanging. Note: tapestry rods and tassels, where pictured, are not included in the price. Dimensions: W 23" x H 16"